Halloween is more my speed. It was such fun finding new spooky images to make cards. However, I will be doing some craft shows this season. Best to have some Christmas cards for the masses. I spent the weekend chained to my craft room designing. I thought I would post a few of the cards I’ll be adding to my shop. I thought this girl was a doll baby. I glittered up her hat. I was able to figure out how to cut her hand out to make her look like she is holding the candy cane. Most of my images are from my ,graphic’s Goddess Patty, from Lisa’s Altered Art. This little guy is fun. 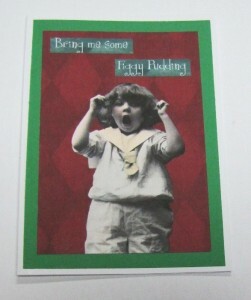 The words say, “Bring me some Figgy Pudding” What kid doesn’t have a tantrum around Christmas time? What is Christmas without a snowman? He has fancy glittered ear-muffs. All ready to send for a cheery greeting. Those were my favorites. I have several others as well. I will be letting people know they can change the wording on the cards if they prefer. 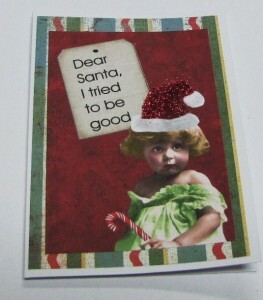 I’m not making Happy Holiday cards, but will gladly change the wording for someone. 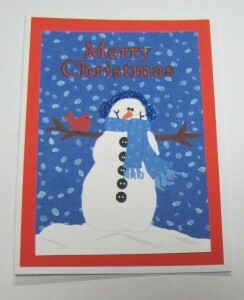 I will also be offering the option to order several cards at one time. 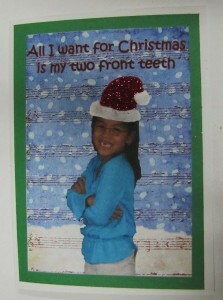 Michele is going to send me a couple of pictures of her with Santa and some other images to use for cards. I’m always looking for fun vintage images. Jade is the exception to that rule. It’s hard to find a vintage image of kids missing teeth. That was my weekend. I need to get moving so Mr. Bernie can take a couple of pictures for me this morning. I need to get them mailed off to a magazine today. We took some, but they really didn’t turn out. Today is a new day. Have a great Monday! The cards look awesome, Bernie!!! LOVE the first one especially! Thank you. Christmas cards have not been as hard as I expected them to be. Well I am glad Cheryl knew what Figgy pudding was, I sure didn't. I love fruit cake so I looked up the link she sent, it sounds yummy, not as dry as fruit cake, also didn't know what plum pudding was, but I guess its figgy pudding too. Thanks for sharing Cheryl!! Bernie the cards turned out great, I love the little girl. I will get you some images today. No rush. I know you will get to it when you can. Thank you. She is even more beautiful with all her teeth. I found that boy this weekend and was so darn excited!! Thank you. I knew either you or MIchele would have the answer. I love those cards!!! I am sure they will all be best sellers!!!! You rock, Bernie!!! Look at you being all poetic so early in the am! I\’m impressed. Thanks, Beth Ann. You made my morning. OMG!!! Bernie I need that figgy pudding card! Tom has been talking about figgy pudding for weeks. I don't even know wtf figgy pudding is. Too funny!